Do not play with the sun. Exposure to the sunrays is extremely dangerous without good protection ad may lead to serious skin disorders and sunburns. That is why you should alwas remember about good suncreen cosmetics. At the beginning choose cosmetics with high filter protection so that your skin will be prepared for a sudden and longer exposure to the sunlight. Body lotions spf 30 won’t be any exaggeration. If your complexion is dark, you are not prone to sunburns and you can think of using spf 15 and with the course of time take some lower spf. They will make your suntan last longer, chill your heated body and bring a nice relief after the whole day spent on the beach. 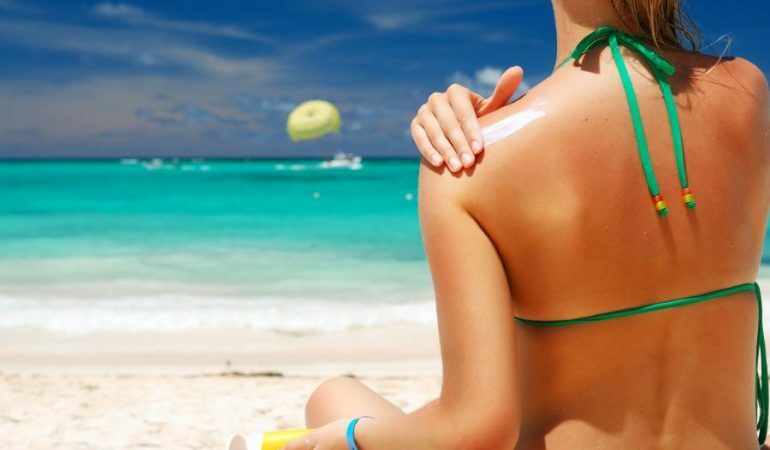 Addiionaly, after sun creams will moisturise your dried by the sun skin. 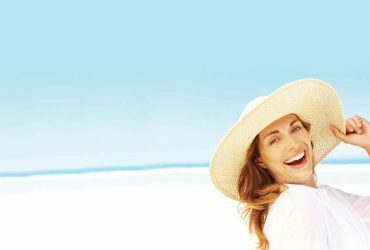 If you do not want the surprises like red and peeling skin after suntan to become one of your experiences, you definitely should buy a good lotion which will moisturise and regenerate your body. It’s a wonderful cosmetic that can be used at all times. It brings alleviation, chills and provides necessary minerals and moisturising substances. It can be used at daytime (it will tonify your skin) and after suntan (brings a relief and nourishes) as well as while doing everyday make-up (sprinkle your make-up brush or beauty blender with it to make your make-up last even longer). We use them all year round but in the summer the list of them is longer. On a long summer trip a good cream or spray for abrasions and skin irritation, chilling gel which will relieve your tired legs and anti-perspirant deodorant that will refresh and moisturise your feet may all come in handy. If you don’t want to look like a koala bear after a swim, that is having a black smudges under your eyes -use a waterproof mascara. It’s long -lasting and using it means a make-up without smudges and unwanted surprises. Bronzers are also on top in the summer time. They make your suntan more visible and give it an illuminating effect, lighten up and make every woman look more beautiful. Using bronzers is a good idea for a night-out make-up to improve your face contours. Apply it on your cheekbones and around the temples and any other parts which are exposed to sunlight. You’ll simply look amazing! The two are highly recommended for your summer make-up. Using spf foundations you will provide your skin with additional protection from harmful radiation and slow the skin ageing process. But you must remember not to overuse your foundation. Ideal matt make-up finish that will last for many hours will be possible with a tranparent bamboo and rice powder. You can really rely on them. Leave your perfumes at home. In the summer your skin will love delicate and refreshing scented waters that do not cause discolourations. Instead of sprinkling your skin with some strong pefumes, take the delicate and subtle scents made especially for you on these hot summer days. The eight cosmetics above are the minimum which will help you to survive hot temperatures avoiding skin problems. So do not hesistate to add the list to the most frequently used cosmetics of yours. And do not forget to take a spf lip balm into your purse. Have a nice holiday! Fatigue and aching legs? Treatments and relaxing exercises.